With Russian authorities set to destroy confiscated food products that are embargoed from the West at the border beginning August 6, there are those who caution against destroying food. The presidential decree mandates that embargoed foods will be destroyed if caught at the border or seized from stores. However, some observers have urged the government to reconsider the order to destroy the products, and give them instead to those in need. The planned launch of a drive by Russian authorities to destroy all confiscated products falling under a Russian embargo on Western food imports, has met with mixed reactions. Some commentators favour the presidential decree which makes it mandatory to destroy embargoed western food products caught at the border or in stores, while others have sought that the confiscated foodstuffs be distributed in schools, orphanages and other welfare institutions. The decree, signed by Russian President Vladimir Putin on July 29, 2015, comes into effect from Thursday, August 6. According to the President’s official website, the decree covers produce coming from the United States, the European Union and other countries that have imposed sanctions on Russia over the Ukraine crisis. The decree does not, however cover food items brought into the country by individuals for their personal consumption. According to the presidential decree, the destruction of banned food imports will be carried out immediately after their seizure. Moreover, the authorities will seek banned foods not only on the border but also throughout the country, including stores and retailers’ warehouses. How much banned produce is crossing the border? According to the Federal Customs Service – the official agency that records imports and exports in the country – the controlling authorities seized 552 tons of banned products in the first half of 2015. In turn, as Deputy Prime Minister Arkady Dvorkovich noted, the regulatory authorities have recorded approximately 700-800 food embargo violations in recent months. Russian authorities have also seized 44.8 tons of embargoed products from stores. The process of elimination will be documented in photo and video form, and must take place in the presence of at least two impartial persons. 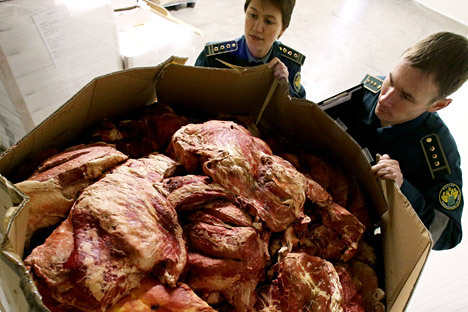 Deputy Agriculture Minister Yevgeny Gromyko told the Russian news agency Interfax that plans are already in place for disposing of fats, cheeses, fruit and vegetables; they will be burned in special furnaces, but the question of how to dispose of meat products remains unresolved. Timur Nigmatullin, an analyst at investment holding Finam, says that banned goods are continuing to leak across the Russian border principally because of the legal framework on which the Eurasian Union – the Russia-led economic organization of which Belarus, Kazakhstan and Armenia are also members – is based. “The impossibility of the implementation of the embargo is fully due to the peculiarities of the supranational law and customs regulations in the framework of the Eurasian Union,” said Nigmatullin, explaining out that the weak link in the chain is Belarus. Minsk has pointedly not followed Russia in implementing sanctions against EU food imports, while border controls between Belarus and Russia are practically non-existent. However, Nigmatulin argues that on the whole the food embargo has been a success for Russia. “The introduction of the food embargo had both geopolitical and macroeconomic grounds in the form of support for domestic producers. In both cases the desired effect has been reached,” he said. According to him, even the imperfection of economic institutions and government regulation in the country in this respect is not critical. The presidential decree has caused different reactions in society, said Natalya Shagaida of the Center for Agricultural and Food Policy at the Russian Presidential Academy of National Economy and Public Administration, who said that she personally had an “extremely negative attitude” to such practices. “In general, Russians have quite a reverent attitude to food, to the work of those who produce it. A large part of the population sees the burning [and] destruction of benign products as blasphemous,” she said. According to Shagaida, Russian citizens reduced their consumption during the crisis and eliminated costly products from their diet, as evidenced by the retail food index. According to the Economic Development Ministry, retail trade turnover decreased by 8 percent in the first half of 2015, including by 7.7 percent in the food sector and by 8.3 percent in the non-food product group. “It is better to confiscate benign products instead of liquidation, thus punishing those suppliers or customers who violate the government's decisions, and then to transfer them to schools, orphanages, homes for the disabled,” said Shagaida. However, according to Ilya Balakirev, the destruction of produce is, in general, a common practice in many developed countries. In turn, according to the Russian daily Izvestia, the State Duma deputy from the center-left party A Just Russia, Andrei Krutov, has sent a letter to Agriculture Minister Alexander Tkachyov calling for the government not to destroy the banned food products but send them to the Donbass region of eastern Ukraine, where the population continues to suffer from food shortages amid an unresolved conflict between Ukrainian government troops and Russian-backed militants.